Home / #TrueNews / Israeli / Religion / True News / Shameful outrage against Christian Religion: 'Mc Jesus statue' exhibited in Haifa (Israeli) museum ! Let's go to remove it ! 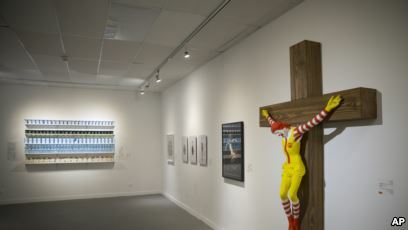 Shameful outrage against Christian Religion: 'Mc Jesus statue' exhibited in Haifa (Israeli) museum ! Let's go to remove it ! Mc Jesus statue exhibited in Israeli museum! 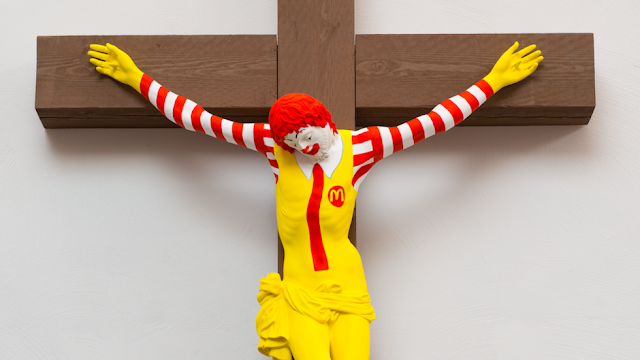 An art exhibit featuring a crucified Ronald McDonald caused chaos in the Israeli city of Haifa last week, after members of the country’s Arab Christian minority took offence at the depiction and protested outside the museum. Hundreds of Christian protesters called for the statue, titled ‘McJesus,’ to be removed from the museum, with Israeli police saying that some rioters even hurled a firebomb at the building and threw stones, shattering windows and injuring officers. Crowds were eventually dispersed with tear gas and stun grenades, according to the Associated Press. TUNE TO AMERICAN ROAD RADIO : CLICK HERE !